The Obama administration is deferring judgment about whether President Mohammed Morsy was ousted in a coup while the Egyptian political process moves forward. "There's an elephant in the room here," White House Press Secretary James Carney told reporters on Tuesday. "It is in our national interest – the best interest of the United States, and the best interest, in our view of our goal in assisting the Egyptian people, in their transition to democracy to take the time necessary to evaluate the situation before making such a determination." Another U.S. official was more blunt. "A policy determination has been made the meantime to call it nothing," the official told CNN. "We hope to be in a place where the determination is no longer an issue," the official added, referring to the political process underway in Egypt. The United States has been reluctant to choose sides in Egypt's political standoff, with officials stressing the main priority is minimizing violence and ensuring inclusiveness in the political process. 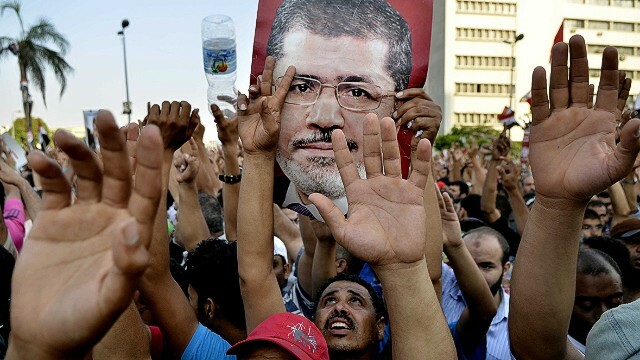 Officials feared the United States could make things worse by inserting itself in the conflict, considering Morsy was ousted with broad public support. Moreover, no legal determination enables the United States to continue $1.3 billion in aid to Egypt, which it would have to cut off if a determination was made that a coup took place. Officials argued a collapse of the Egyptian economy would only further destabilize the country. State Department spokeswoman Jennifer Psaki told reporters that, "broadly speaking," the administration still believes that continuing military aid is a U.S. national security priority. The State Department and U.S. Embassy in Cairo are urging the military to shed any appearance of a coup and put in place a political process that moves the country on a democratic path. "We are telling the military to get the ball rolling, and avoid any appearance of military rule," another official said. "Appoint a prime minister, put a new cabinet in place and announce elections." Likewise the United States is calling all sides to engage in a political process and move the country toward elections, emphasizing the need for inclusiveness. Officials are trying to persuade the Muslim Brotherhood to move past the military action against Morsy and re-enter the political process. "We have emphasized that they need to engage in the political process and ensure they have a say in the final outcome," the second official said. I want to stay neutral but i cant this guy sounded like a goof. I can't believe he couldn't make it a year. All he had to due was put the people to work. Morsy had his chance he needed to create jobs and put Egyptians back to work. Instead he allowed his people to slaughter Christians and grab for power. I love this! "in our view of our goal in assisting the Egyptian people, in their transition to democracy to take the time necessary to evaluate the situation before making such a determination." The only problem is Egypt is now buying weapons from Russia because of this decision. Hurry, hurry, hold elections quickly!!! Doesn't matter who you vote for, just vote so you can be labelled "democratic"! Worked out well in Iraq and Afghanistan (ha, ha, ha)! Let's get an election scheduled in Syria, too! That should solve everything! Remember, the people of Gaza also voted in their "leaders", great democratic Palestine today! OMG! AlJazeera is reporting Obama administration funded the Coup. But CNN chooses not to report this????!!!! And the whole world knows they print only the truth...........not! That is why I always try to see what is on Aljazeera since CNN and other American media outlets are busy being controlled by the government and the corporations on what to report. "We have emphasized that they (the Muslim brotherhood) need to engage in the political process and ensure they have a say in the final outcome"
Right, participating in the democratic process is good. Hey remember that time your party took power in free and fair democratic elections, but then we continued to support your military as they ousted the president in a ....... Rousing game of "replace the leader by force"? Yea, forget about that time and remember to participate in your political process peacefully! We promise to honor the results this time, as long as you lose. Of course it was a coup. It just happens to be a very popular one. I suppose it doesn't really matter that giving funds to a country that just had a coup is against US Law. What was a country of laws is now a country in trouble. This administration turned the US into a banana republic. Ok, let's call it what it is... A coup. Do you really believe the US is going to pull Egypt from Uncle Sam's teet? As long as them and the Saudi's are in bed with us, then they could slaughter every 3rd person on the streets of Egypt and there would be no action from the US. Our country has become nothing more than a farce, a virtual laughing stock to the rest of the world. Bush took us to the edge, and Obama just went ahead and shoved us off the cliff. I heard that even the Statue of Liberty has filed her papers to go back home to France! It's just another shameful example of what happens when hollow threats and broken promises are perpetuated by world leaders. Sad. It was a coup, but law doesn't matter in the US any more. If the right-wing thugs are so concerned with violence in Egypt, they can always get the the French to invade and then occupy Egypt and teach them how to speak French and convert to Catholicism. After all, the French already have a very powerful military so let them take over in the Middle East instead of us as a purported ally. The only issue is that the US also intervened in the first election, rushing a democratic election before parties were properly formed and got a chance to campaign. As a result, the winner was Morsi, who was the only one properly funded outside the Mubarak regime. The Egyptian people had to pay for this through a year of bad leadership. I agree that we need to create a timeline and get a process in place for election, but please don't try to impose a timeline on Egypt and rush the process again, or we will be back in the same place in 12 months, except with a totally collapsed economy. The military has no interest in running the country, but they do have a vested interest that the country's economy improves over time (since they own many large businesses as well). There is a transitional government in place that most of the moderate media considers to have the best-interest of the people (unlike the Morsi and Mubarak regimes). This transitional government knows very well that their fate will follow Mubarak and Morsi if they don't hold the best interest of the people and work to move the economy forward instead of backwards. So my only problem with this article is in the following statement. ""We are telling the military to get the ball rolling, and avoid any appearance of military rule," another official said. "Appoint a prime minister, put a new cabinet in place and announce elections."". Please stop trying to "tell" the Egyptian government what to do. You are not their parent/guardian and Egyptians have too much pride to be told what to do, especially given the history of the US and involvement with other middle-eastern countries.